When you search for airfare on American, Delta, or United Airlines, you're likely to be offered three different options. You have the standard economy ticket, which includes a carry-on suitcase and a personal item that can fit under the seat in front of you, such as a briefcase, purse, or small backpack. Standard economy tickets also tend to include seat assignments and can be upgraded or changed for a fee. Then there are the economy plus, or economy comfort seats, which offer additional legroom and a free checked bag. These fares may also include priority boarding and even a free alcoholic beverage. On the other end of the spectrum are the newer, basic economy class fares. Although the seat is the same, it often won't come with seat assignments, and you may be randomly assigned a seat at check-in. Basic economy fares may not include a carry-on suitcase, just a personal item. Also, you can't receive upgrades based on elite status, and you may not be able to make changes to your reservation at any price, except within 24 hours of purchase. 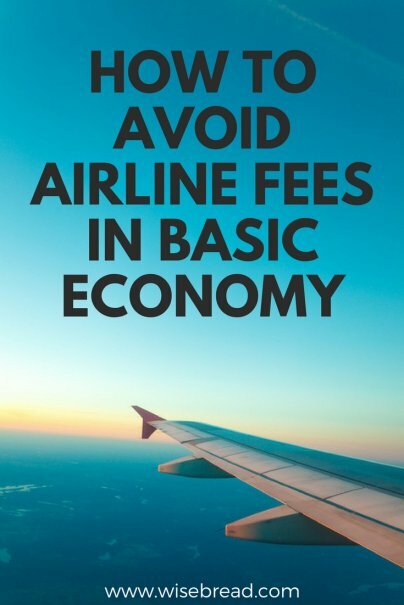 So how can you save money on basic economy fares without paying extra fees? Here are some suggestions. Not all airlines have the same basic economy rules, and some are actually not so bad. For example, Delta's basic economy fares allow you to bring a standard carry-on and a personal item, just like any other passenger. In addition, you'll get your seat after check-in. In contrast, United and American only let you have a personal item and can assign the seat to you without you having a say. When you fly on basic economy fares, you'll have a pretty high chance of being stuck in the dreaded middle seat. However, there are some smaller airplanes that don't even have middle seats, so you are guaranteed a window or an aisle. To ensure that your basic economy fare won't put you in the middle seat, look for regional flights on the Bombardier CRJ or Q400 planes, or the Embraer ERJ planes, which only seat three or four across, rather than Boeing or Airbus aircraft that seat six or more across. Every airline allows passengers to bring a personal item with them, even on a basic economy fare. Although this can be a purse, briefcase or backpack, it doesn't have to be. You can carry a duffel bag or even a small roll-on suitcase, as long as it fits within the specified dimensions. In today's world, there's no need to pay to use an in-flight entertainment system. Simply bring along your own smartphone, tablet, or laptop downloaded with music, videos, and games. Other premium travel credit cards offer airline fee credits that can be applied to things such as luggage fees, change fees, and charges for in-flight food and entertainment. Using these credit cards restores many of the comforts associated with standard economy seats.